To transfer a license to a new user or to a new machine follow the steps below. 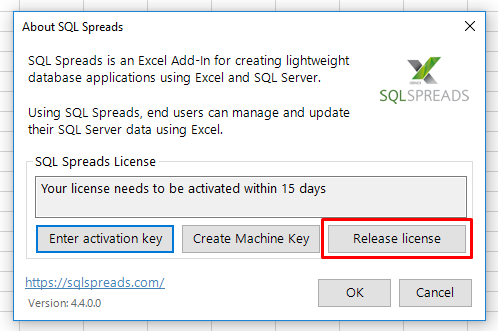 In the SQL Spreads tab in Excel, click the About button. A confirmation dialog is shown and you can now enter and activate the license key on a new machine. Install the license key on the new machine. Create the machine key and then include a note that this is a transfer of a license that is not released yet when you send the email with the request for the activation key.